Click on the following links to access resources on Talking With Children and Dealing with Terrorism and Violence. The April 15 bombings at the Boston Marathon bring grief to many and revive perennial questions of "why?" 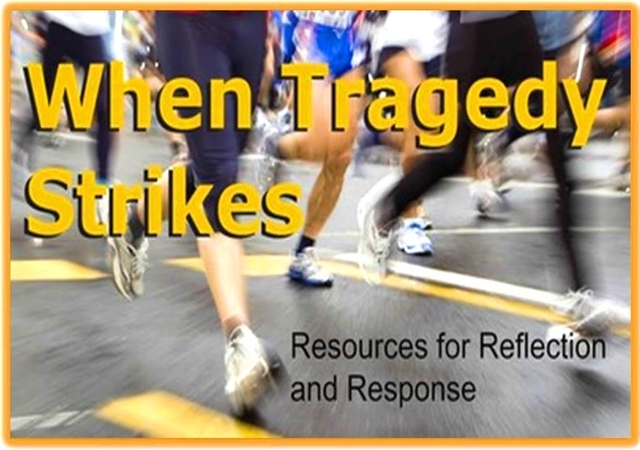 The following articles and blog posts from Ministry Matters offer insights that may help you and your congregation in the wake of tragedy. Talking to Children Following the Boston Marathon Bombing...And Listening! Here we are again at a place where we need to reassure children that they are safe even when we may not feel safe ourselves. The tragedy in Boston, Massachusetts, seems so near to me this morning. My daughter went to Berklee College of Music in Boston, and we have many good memories of the city. Terror and tragedy gripped the churchgoing population of Knoxville, Tennessee and rippled across the country on July 27, 2008 as reports spread of a violent shotgun attack. On April 16, 2007, thirty-three lives were violently lost on the campus of Virginia Tech in Blacksburg, Virginia, where as I serve as a United Methodist pastor. Ministering to People in Crisis: Don't Just Stand There! What do you say or do when people's lives are falling apart? Feeling put on the spot may be uncomfortable, but as clergy and leaders, it is our role to have words and actions at the ready. A month ago my wife and I were in New York City and went to the World Trade Center site. Standing there and contemplating what happened made the hair on my neck and arms stand up. Last month two-time Indianapolis 500 winner Dan Wheldon died in a sudden, horrible 15-car crash during the IZOD IndyCar World Championships at the Las Vegas Motor Speedway. Why? Job's dialogue with God (Job 38:1-42:6) stands as one of Scripture's most vivid depictions of the struggle to understand and respond to suffering and evil. Even for people familiar with the destruction tornados can inflict, the images from Joplin, Missouri, were horrific.